When the matric results were released on Monday this week, the Deputy Minister of Education Enver Surty chastised us in academia for “denigrating” the schooling system, claiming that now is not the time for pessimistic criticism but rather for celebration and “inspiring hope”. The Deputy Minister will have to forgive me because I find it incredibly difficut to celebrate when no one is really acknowledging the 550,000 students who started school 12 years ago but have been silently excluded from the schooling system, dropping out before matric. To be specific, of 100 students that started school 12 years ago, only 51 made it to matric in 2013, 40 passed and 16 qualified to go to university. These youth that drop out before matric are completely marginalized and pushed to the fringe of society, forgotten amidst the hype of those who passed. Minister Motshekga is no exception. In her 5000 word speech, she devoted all of 10 words to discussing the issue: “The sector needs to urgently reduce repetition and dropout drastically.” That’s it. Two strong adjectives and a hat tip? I’ve been told by some that now is not the right time to talk about this. But when is the right time to talk about it? June? September? It’s never comfortable or convenient to talk about half a million children dropping out of school and facing unemployment or menial work – something that happens year in and year out. To address the second part of this statement first, if South Africa’s education is an “equalizer” between poor and rich, why is it that South Africa’s income inequality has increased since the transition? While it is certainly true that if quality education is offered to rich and poor alike it will lead to a situation of increased social mobility, this is not the case in South Africa. 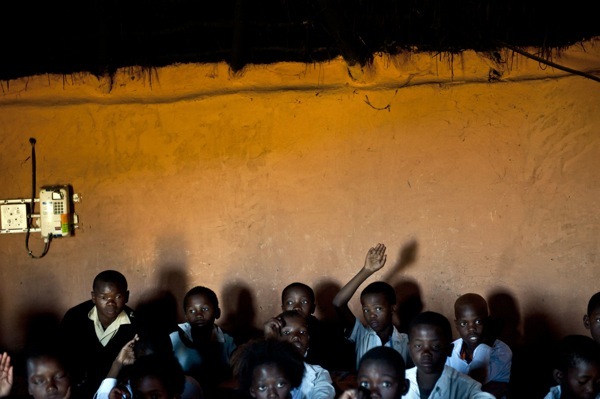 In South Africa we have two public schooling systems: one which is functional, wealthy, and able to educate students (about 25% of public schools); with the other being poor, dysfunctional, and unable to equip students with the necessary knowledge and skills they should be acquiring in their schooling career (roughly 75% of public schools). Apart from a small minority, most black children continue to receive an education which condemns them to the underclass of South African society, where poverty and unemployment are the norm, not the exception. This substandard education does not develop their talents and abilities or expand their economic opportunities, but instead denies them dignified employment and undermines their own sense of self-worth. In short, poor school performance in South Africa reinforces social inequality and leads to a situation where children inherit the social station of their parents, irrespective of their motivation or ability. That is how income inequality increases. The second part of her statement – that matric results do not hide inequalities – is also patently untrue. The matric results, like every other educational data set in South Africa, hide enormous inequalities that sometimes aren’t immediately apparent. Before getting to the matric 2013 results, let me summarize some of the findings from the numerous studies highlighting South Africa’s ongoing educational inequalities: 1) The SACMEQ study of 2007 showed that there are huge geographic inequalities in the country with 41% of rural Grade 6 children being functionally illiterate compared to only 13% of urban grade 6 children. The prePIRLS study of 2011 showed the large linguistic inequalities exist: Of those children whose home language was Xitsonga, Tshivenda or Sepedi, one in two (50%) could not read by the end of Grade 4 compared to one in ten (11%) for English and Afrikaans children, and 3) The General Household Survey of 2011 showed that there are large racial inequalities in matric attainment: only 44% of Black and Coloured youth aged 23-24 had attained matric compared to 83% of Indian youth and 88% of White youth. We could also look at the TIMSS study of 2011 or the NSES study of 2009 or any of the Annual National Assessments or a host of others – they all show the same thing – systemic inequalities and underperformance. But if we take a closer look at the matric results for 2013 we will see that they too hide severe inequalities. When allocating funding to schools, the Department classifies them into one of five categories called quintiles. Each quintile is meant to have 20% of schools ranging from Quintile 1 (the poorest 20% of schools) all the way up to Quintile 5 (the richest 20% of schools). The funding allocations are pro-poor with Quintile 1 schools receiving R905 per learner and higher quintiles receiving progressively less funding all the way up to Quintile 5 schools which receive R156 per learner. 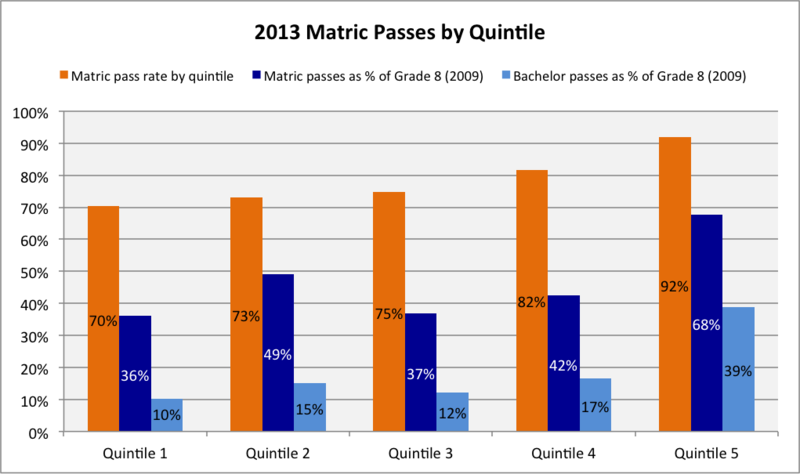 On the surface the differences between the matric pass rate by quintile are not too large with 70% of matrics from Quintile 1 passing and 92% of matrics from Quintile 5 passing. But this hides the fact that pre-matric dropout is twice as high in Quintile 1 compared to Quintile 5. If we looked at the number of enrolments in Grade 8 in 2009 (i.e. when the matric 2013 class was in Grade 8) there were 206,031 students in Quintile 1 schools and 141,905 students in Quintile 5 schools (the numbers are not equal between quintiles because schools prefer to be classified in lower quintiles to receive higher subsidies). But by the time they got to matric there were only 105,954 Quintile 1 matrics and 104,344 Quintile 5 matrics. That is to say that 49% of Quintile 1 students dropped out between Grade 8 and Grade 12 but only 26% of Quintile 5 students dropped out between Grade 8 and Grade 12. So if we rather calculate the matric pass rate as a percentage of those enrolled in Grade 8 four years earlier the figures change drastically being 36% in Quintile 1 and 68% in Quintile 5, i.e. of 100 Grade 8 Quintile 1 students, only 36 made it to matric and passed. Of 100 Grade 8 Quintile 5 students, 68 made it to matric and passed. Similarly, the proportion receiving bachelor passes by quintile is only 36% for Quintile 1 matrics and 68% for Quintile 5 matrics But if we calculate it as a percentage of Grade 8 enrolments four years earlier the figures drop to an abysmal 10% for Quintile 1 and 39% for Quintile 5. As a proportion, the number of Quintile 5 students in Grade 8 that will go on to pass matric with a bachelor’s pass is four times higher than that for Quintile 1 students. These shocking results are not limited only to Quintile 1 – the graph shows that the results are very similar in Quintiles 2, 3 and 4. In highlighting these results it is not my intention to be the prophet of doom of South African education. I actually do think things are improving and we should give praise where it is due. Minister Motshekga has presided over a number of very important reforms including the introduction of the Annual National Assessments (ANAs), the implementation of Curriculum Assessment Policy Statement (CAPS), the roll out of the workbooks and the establishment of NEEDU. By focussing on the basics the Minister has laid the foundation for improvement and I agree that we are beginning to see the fruits of these efforts. Because of this I also happen to think she is the best Minister of Education we have had to date. But to claim that the results do not hide inequalities is absolutely unforgiveable. If there is one thing that is clear from the local and international research on South African education it is that our schooling system is egregiously unequal. That finding is simply not up for debate. While the low-level equilibrium that South Africa finds itself in has its roots in the apartheid regime of institutionalised inequality, this fact does not absolve the current administration from its responsibility to provide a quality education to every South African child, not only the rich. Until such a time as the Department of Basic Education and the ruling administration are willing to seriously address the underlying issues in South African education, at whatever political or economic cost, the existing patterns of underperformance and inequality will remain unabated. Nic Spaull is an education researcher in the Economics Department at Stellenbosch University. He blogs about education research at www.nicspaull.com and he can be followed on Twitter @NicSpaull. An interesting read. However, I am sure you could find better statistics to ‘prove’ inequality exists. I am the first person to agree with the social and distributional inequality that exists in education today but to try and make your point by using the linguistic variable is misleading. So its kinda ironic that you are using it to show the misleading gov stats. Showing geographic inequality by linguistic inequality as the proxy is problematic because (IMO) of the 41% of rural learners who are functional illiterate as opposed to the 13% urban learners, how many of the rural (deep rural) learners have the luxury of learning in their L1? In other words, given that the LOLT is predominantly the language of white English or Afrikaans learners, and given that very few, if any of these learners, make up part of the rural school population, it stands to reason that urban kids will outperform rural kids having to learn in their FAL or FL? Does this point directly to geographic inequality in the schooling system? No. Linguistic proficiency is developed early on in a child’s life. A failure to develop proficiency in ones L1 (African language) retards development in ones FAL (English which is the LOLT), or requires almost double the time needed to develop proficiency in the LOLT. Most developed countries with the best resources in their schools have similar literacy inequalities. Instead of using linguistic stats to prove educational inequality, you should be looking at the level of school resources made available at low functioning schools. For example, of the schools that offer a lower quality of education, how many of those teachers are actual teachers? How many of them have up-to-date text books? If they do have textbooks, how many of the schools actually use them or are they locked away for fear of them being damaged? How many of those low performing schools manage to maintain their subject teachers once the DoE has set the grade 12 subject package etc etc. What shows up as geographic inequality is symptomatic of a ‘broader’ linguistic problem! It is a mask. You often mention that the stats speak for themselves but sometimes a deeper understanding of the educational context is need to truly unpack the stats. In a nutshell, I agree 100% that we have massive inequality. If we didn’t I wouldn’t have dedicated the next 3 years to a PhD in eradicating literacy inequality. But to use a variable that has its roots in the home to show the educational system is not functioning correctly is misleading. Check out the” Enlightening the Hearts” Study implemented in Western Ghana.. Over 22,000 Black students currently have participated ..The students using the program more than tripled their national language of English proficiency skills.. Unequal Education is the product of Government. I am teaching and training people since 1984 with huge success, using the Advance Training Concept that is based on the PEP Principle – Proficient, Employable and Productive with Workplace readiness as the ultimate goal. (258 Apprentices pass Trade Test and Employment within three months.) Medupi and Khusile projects.Education and Training nowadays is not designed to achieve this. I proved Competence Invalid many years ago. This just in short, I can go on and on. There is no reason for this to continue the way it is now. We can be the most powerful country on earth if so people just want to listen to people like me.